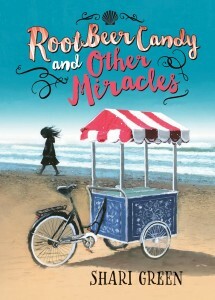 In Root Beer Candy and Other Miracles by Shari Green, 11-year-old Bailey knows spending her first summer with Nana Marie is just one more sign of many that her parents’ marriage is in trouble. While they go on a retreat to try and salvage their relationship, Bailey and her younger brother, Kevin, are left to deal with the tension and fear of a possibly imminent divorce. Life in Felicity Bay challenges Bailey to look outside herself, however, when the local ice cream man, Jasper, makes a series of startling prophecies. Finding herself drawn into the heart of a town steeped in misery, Bailey keeps her faith in the goodness of others and looks for miracles to help heal the wounds of the past. Writing in verse, Green aptly captures the journey of a girl faced with her first real heartbreak—the likely dissolution of her family. Bailey’s openness to confronting her reality while still believing in the extraordinary adds to her charm, as does her growing realization that heartache affects many others in her life as well. The colourful and mysterious small town of Felicity Bay and the ocean it borders offer the perfect backdrop for Bailey’s awakening to the larger world around her. With a renewed sense of connectedness and a greater understanding of family, Bailey emerges from her summer of change hopeful for the future. 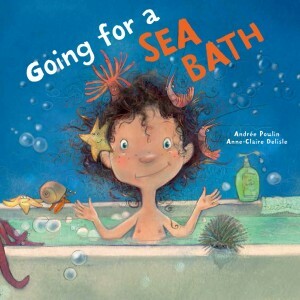 “In the whimsical picture book Going for a Sea Bath, Andrée Poulin takes young readers on a trip to the ocean…right in the bathtub! Leanne does not want to take a bath because baths are boring, and there is nothing to play with in the tub. Her father, undaunted by his daughter’s reluctance, has an idea to make bath time more fun. He runs all the way to the sea and returns with one turtle. When the turtle doesn’t do much, Leanne’s father returns to the sea, bringing a succession of expressive sea life for her to enjoy in the tub. From two eels and three clownfish up to nine starfish and ten octopi, Leanne’s bathtub gets so full there is no more room for Leanne! Munsch-esque prose paired with Anne-Claire Delisle’s delightfully playful illustrations will have kids hooked. “Because German Men were conscripted to fight during World War II, the families left behind were obligated to by the Nazi government to take in French prisoners of war to perform needed work. This is why three captives came to stay with seven-year-old Gerda, her mother and siblings at their farm. The rules were stringent: the French were to assist with the operation of the farm, sleep in the out-buildings and be treated as enemies. 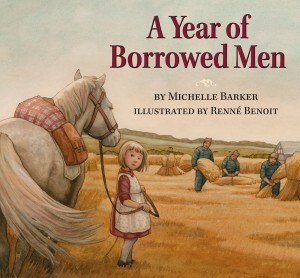 Anyone showing kindness to these “borrowed men” could be imprisoned. It was, however, challenging for Gerda to be so hard-hearted. On one particularly cold day, she invited them to share dinner with her family inside their warm home. For this act, her mother received a stern reprimand from the local police. From then on, compassion was demonstrated in more subtle ways, ensuring that the captives were well fed and treated with dignity. When the war ended, they parted as friends. 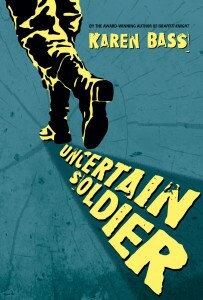 Based on her mother’s childhood memories of Germany during World War II, Michelle Barker’s book is a poignant account of one family’s brave acts of kindness in an atmosphere thick with fear and distrust. The story is told from little Gerda’s perspective, and we witness how a prohibited relationship grew from Feinde (enemies) to Freunde (friends). “The borrowed men knew some German words but we did not speak French. We had to use our hands to show them what we meant. Sometimes I drew pictures for them.” An Author’s Note and family photographs provide further context regarding Gerda’s experiences. This review originally appeared in the Spring 2016 edition of Canadian Children’s BookNews. 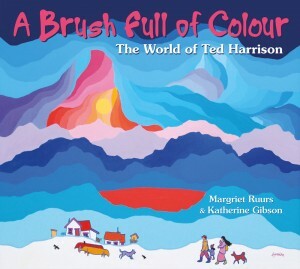 This is a great book for anyone with a wild imagination. 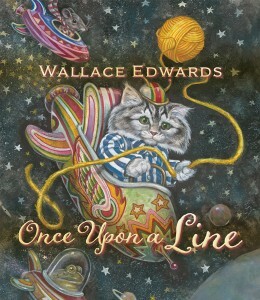 On each page Wallace draws the reader into both the illustration and the words. 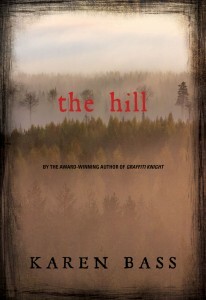 Readers are challenged to find the “magic line” in each picture. In most cases, the story is different, not always exactly what is shown in the picture. For example, we get a dandy rat who loves his “brand new ultra-modern house,” a gleaming white toilet sitting among flowers. The words continue, “‘I have never had such a beautiful home before,’ he said. Just then, a little bird said…” This sentence could lead anywhere, and is an invitation to go somewhere new each time you read it. “During the preschool years, children often forge their first friendships and these relationships can be very intense. 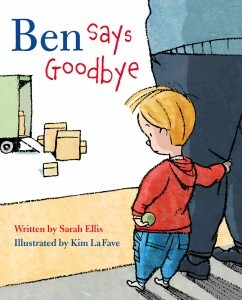 Here, Sarah Ellis explores how a young boy handles his sadness when his best friend moves away. Ben is distraught because his best friend is leaving the neighbourhood. He opts to move, too, and seeks refuge in a cave (the space under the kitchen table) where his sole companion is a tamed (stuffed) lion. Adopting the persona of a cave boy, Ben resorts to grunting the sole sound of “guh” when his family speak to him. While camped out in his makeshift dwelling, Ben finds solace in his two imagined stories about friendship. Using a pointed stick (pencil), he sketches his tales as a series of drawings on the walls of his cave. One tale tells of two boys who are best friends and of their fun and heroic antics. The other tale tells of two friends, living on different sides of the world, who dig their way to reunite in the centre of the Earth for a short visit. When Ben smells butter in the air, he emerges from his cave and rejoins his family to share some popcorn. When he hears a moving truck’s beeping from across the street, he heads to the window to investigate the sound. From his post on the couch, Ben spies a neon-blue Scorcher Scooter—just the perfect size for a new pal. The author offers a charming and delightful story in which a preschooler’s feelings and thoughts ring true. La Fave’s endearing softly-hued illustrations, accentuated by black outlines, accompany this gentle tale. Ben’s cave drawings, rendered in black on an ochre background, populate the book’s endpapers. This is a clever touch that offers readers an additional visual level on which to extend and enjoy the story.